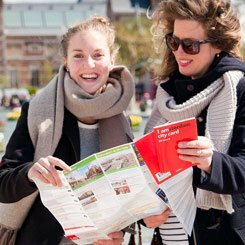 Do you have Amsterdam travel plans? According to the international travel site World66.com, "Amsterdam is one of the coolest cities in Europe." It's one of the most versatile, too. The beautiful 17th-century city center, crossed by hundreds of canals and over a thousand small bridges, make for beautiful city walks and boat tours. Also, few cities have more museums and art galleries than Amsterdam. On the other hand, Amsterdam's club scene, the legal marijuana cafes ('coffee shops') and the notorious Red Light District make it Europe's party city no. 1, too. Of course, the canals in the old city center should be in each Amsterdam travel itinerary. From among others the Rokin (outside Central Station) and the Leidseplein area you can take various boat toars across the canals. Canal Company also also runs a hop-on-hop-off canal 'bus' boat that tours most major spots, including the museums. You can buy a ticket for a 24-hour time slot. Squares great for going out and watching people are the Leidseplein and the smaller Spui. We like the Rembrandtplein too, with it's many terraces and street artists, but be warned that it's touristy. The ever popular Vondelpark is great for roller skating, picknicking or just watching the clouds while on your back. The most popular Amsterdam museums are the Rijksmuseum (showing the 17th Master oil paintings, although one wing only currently), the Van Gogh Museum and the poignant Anne Frank House where this world-famous Jewish girl hid during World War II. For the Amsterdam red light district and the coffee shops (i.e. marihuana cafes), see our separate pages. 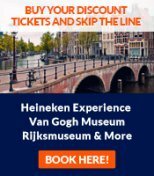 With the I Amsterdam Card, available for time slots of 24, 48 or 72 hours, you'll have free access to most museums (but not the Anne Frank House!) and all public transportation inside the city, while you also get several Amsterdam travel discounts and freebies, such as a free canal boat tour. Details are at the tourist information for Amsterdam page. In Amsterdam, you'll clearly recognize three types of cafes: the folksy brown pubs (bruine kroegen), the hip designer cafes and the classy grand cafes. You'll find our best recommendations on the Amsterdam cafes page and the Amsterdam pub guide. 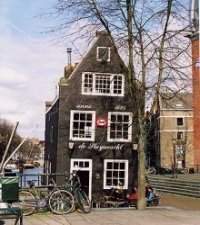 Also typical for Amsterdam are the proeverijen, the tasting houses connected to famous old breweries where you can taste jenevers (gin) or special types of beer. Try De Ooievaar (St. Olofspoort 1) or De Drie Fleschjes (Gravenstraat 18). Among the many recommendable restaurants are the small, cheap Asian eateries around the Nieuwmarkt area ('Chinatown') and the many classy or hip lunch & lounge bars you'll find within the grachtengordel (the circle of canals in the old city center). A tip: De Jaren (Nieuwe Doelenstraat 20) has great food and one of the best terraces in the city, overlooking the Amstel river. Most people travel to Amsterdam by air. Amsterdam is the 4th busiest European air hub, so finding cheap flights to Amsterdam generally is no problem. 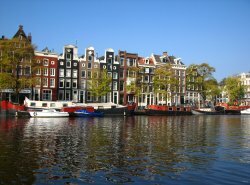 Read here how flights to Amsterdam from any part of the globe work. 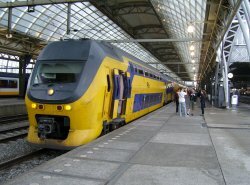 But there are many ways to Amsterdam: by air, rail, car, bus and even boat - here's an overview of all the means to travel to Amsterdam and the details about international train travel to Amsterdam. Oh, and where is Amsterdam actually on the world map? Amsterdam travel is possible throughout the year - it's basically an all-year-round destination. But many would agree that the spring and late summer are the best times to visit Amsterdam. The Amsterdam weather is pleasant then but the city is much less crowded. High summer is still warmer, but July-August herds of tourists flocking the city. In December, the Santa Claus feast (Dec. 5th) and Christmas create a special, cozy atmosphere in Amsterdam. It's a bit of a myth that Holland is very rainy - most days have no rain at all. 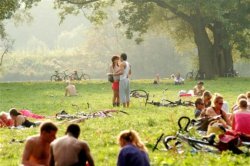 But here are tips on things to do with any kind of weather in Amsterdam - sunny or rainy. More Amsterdam tourist attractions, including a few off the beaten track.